(Steven T. Dennis, Bloomberg News) The No. 3 House Democrat Sunday offered a path for a deal that could end the partial government shutdown, focused on a permanent solution for immigrants brought the U.S. as children rather than a three-year reprieve offered by President Donald Trump. “Let’s go back and forth on this and see where we can find common ground,” House Democratic Whip Jim Clyburn of South Carolina said on “Fox News Sunday.” He spoke the day after Trump made his offer, which was rejected even before he presented it by Speaker Nancy Pelosi and other Democrats. But Clyburn said Trump should first agree to open the government to give Congress several weeks to negotiate a deal that would include more money for a wall on the southern U.S. border. Trump is demanding $5.7 billion. 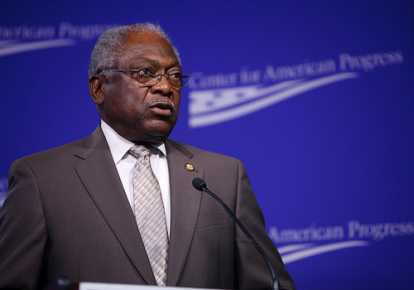 Clyburn noted that Democrats have already offered an additional $1 billion for border measures including upgrades at ports of entry. Clyburn said Trump also now seems to be talking more about “barriers” instead of the wall, a shift Clyburn welcomed. The Democratic measure would provide $563 million for immigration judges and $524 million for upgrading ports of entry. That’s up from $504 million for judges last year and $254 million for ports of entry. “I’ve been talking about barriers for a long time,” Clyburn said. While Clyburn pressed the Democrats’ insistence that Trump agree to open the government to allow time for negotiations, the idea of trading border funding for permanent deportation relief is an idea that’s had broad bipartisan support in the past. Fifty-four senators, including most Democrats, backed a path to citizenship for the DACA beneficiaries in return for $25 billion in border funding over a decade. But Trump opposed the bill because he also insisted on cuts to legal immigration. Vice President Mike Pence said earlier Sunday on Fox that the administration was open to negotiations, but he wasn’t willing to concede that Trump’s offer is dead on arrival at the Capitol. “Now people will start voting and we’ll see where they stand,” Pence said. He also insisted that the president’s proposal wasn’t amnesty when asked about criticism from the right. “This is not amnesty, there’s no pathway to citizenship, there is no permanent status here at all, which is what amnesty contemplates,” Pence said.